Screenprinting is the one class I never got to take in college. I always had a scheduling conflict with one of my required art education classes and it just never worked out. 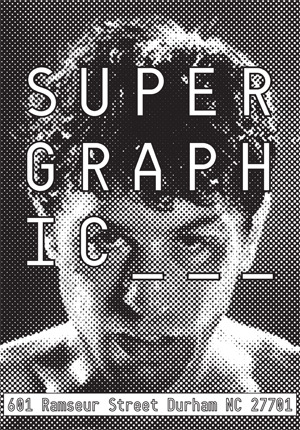 So when I found out about Durham’s Supergraphic, I was psyched. Supergraphic is a fairly new print studio offering work space to experienced and beginning printmakers. They offer classes on several different types of printing processes as well as options to rent studio space by the hour. On Saturday I finally got my chance to take a screenprinting class and it was awesome. The class was taught by Mike Sonnichsen, an art professor at UNC. The day began with everyone getting the feel of pulling ink across a screen to reveal their first image. From there we learned the process of cleaning and preserving a used screen, reclaiming an old screen, and making an image and exposing a screen. We finally ended with a free-for-all print jam using screens made by Bill Fick, Supergraphic’s Director. The images we created during the jam are from the same screens Bill used in a recent mural on view now at the Greenhill Gallery in Greensboro, NC. All images were appropriated from old comic books. I had so much fun in this class. Mike was a great instructor. He answered everyone’s questions and made an effort to help everyone think through their personal projects. I was also really happy with the artwork I created in this workshop. While I didn’t make the screens myself, I selected the images, chose my ink colors, determined my layout and pulled the ink across the screen, making what I created still feel like my own. I can’t wait to use this studio space again and sign up for another class on a different style of printmaking. Next on my list is the linocut workshop.